Singapore is always the soft landing in Asia. It’s cleaner than clean and everyone speaks English so there is no need to twist your brain after travelling half way around the globe. 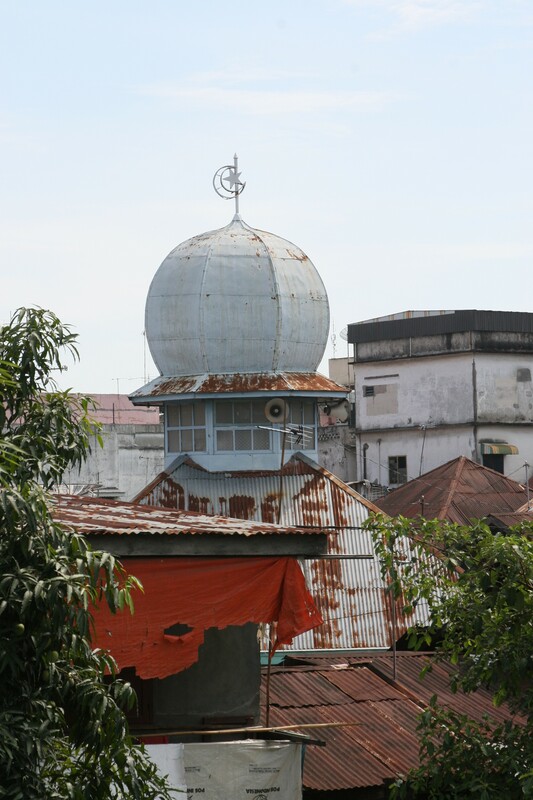 Not so Medan, Sumatra……. Medan is the 4th largest city in Indonesia and with a population of over 4 million (almost all on mopeds) and more than 10 languages heard on the street – it would be easy to plug your ears and head back to Singapore – but where’s the adventure in that? Walking the back streets we came across little ethnic neighbourhoods, kids playing games with popsicle sticks and bits of string, men loitering until they saw us and then they were posturing and poising for the camera. It really didn’t matter that they would never see the photo, and I’m sure they never thought it would appear on a blog. The call to prayer from the many neighbourhood mosques, as well as the Great Mosque, blasts through speakers but the dress code for the women is more lax than some other places on the island. Most local Muslim women who venture outside do wear a hijab headscarf and dress modestly, however Medan is also a tourist mecca for the people from the Aceh provence in the north where sharia law is practiced. In a cafe off the main street an Aussie sea captain and his Aceh wife ( a former flight attendant) held court at one of the tables, drinking beer and telling stories. She was beautiful with a loose flowing dress and her hair free and flowing with plumaria blossoms tucked behind her ear. If she were caught like this in Aceh the ‘moral police’ would lop off her hair. There’ll be more reflections on Aceh later. Interestingly, the local Medanese mock these visitors and call them hypocrites. Late in the afternoon is when the high school kids flood the center of town hunting for a few foreigners so they can complete their homework assignment. We were surrounded outside the Great Mosque and their task – to interview us in English. Some of the older kids were pretty good but when we tried to talk to them about their favorite hangouts, sports, dancing, entertainment etc they had a hard time responding. I’m sure lessons are in rote! Photos of us, photos of them and when they leave they convulse into fits of giggles and non-stop laughter. Getting out of Medan is as simple as going to the airport and buying a ticket for the next plane going your way – the only hitch is the Cash Only sign – scrambling to find a Bureau de Change or an ATM that gives more than $100USD [which is just under 1 million Indonesian rupiah (as in 1,000,000)]! With 1000 rupiah being just 10 cents you often find yourself haggling over a dime. A little silly really! Back to the airport – there is security (simple and kind), a departure tax, and one great big departure lounge for all flights. Walking across the tarmac to the plane we feel like we’ve harkened back to another era. Oh yes and the flights have all been on time! Enjoy the photos around Medan. This city is definitely the gateway to elsewhere and in our case we’re heading to Aceh on the very northern tip of the island of Sumatra. This entry was posted in Sumatra and tagged Great Mosque, hijab headscarves, Indonesia, Medan, mopeds, Sumatra. Bookmark the permalink. Vanda, my dear friend, I am thrilled to be able to follow your travels. Please keep me in the loop, as I vicariously live alongside of you. Oh how I wish I were there. How hard is it to travel like you do? I think both of them are not popular in Sumatera.Maybe you can find it in lietimd store like Batik Keris store,originally them sell Batik clothes, but they also provide Javanese ethnic accessories.Wayang kulit characters taken from Mahabrata and Ramayana epic.Actually it’s a mixed culture between Indonesia and India.The most popular character of Wayang Golek is Cepot.He is easy to recognize due to his teeth.Wayang Kulit is traditional art from Central Java, andwayang golek is traditional art from West Java. Thanks for the kind words Katie and Jo, as far your question – how hard is it to travel like I do – well it is an adventure. Not having definite plans and reservations allows you to be really nimble and change your direction and destination any time. Airlines are like trains and buses here in Asia so you can pick up a ticket just hours before a flight, and finding a small homestay/guest house is very easy. Everyone is generous and kind so you feel welcome. The big trick is to stay far away from the known tourist areas where prices are high and booze flows like water. I am so sorry to hear about my beloved Mexico………….